The conformal predictions framework is a recent development in machine learning that can associate a reliable measure of confidence with a prediction in any real-world pattern recognition application, including risk-sensitive applications such as medical diagnosis, face recognition, and financial risk prediction. 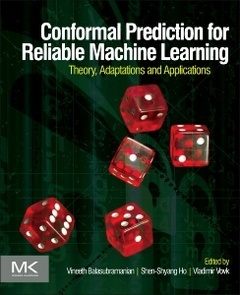 Conformal Predictions for Reliable Machine Learning: Theory, Adaptations and Applications captures the basic theory of the framework, demonstrates how to apply it to real-world problems, and presents several adaptations, including active learning, change detection, and anomaly detection. As practitioners and researchers around the world apply and adapt the framework, this edited volume brings together these bodies of work, providing a springboard for further research as well as a handbook for application in real-world problems.